My husband and I have gone on this wonderful journey of raising some chicks with our son. After lots of reseach we brought... Dare I say it.... 30 pullets home from our supplier. With my "dummies guide" in one hand and a lap top in the other I still continue to pour over the research. With so much knowledge out there I still feel so overwhelmed. 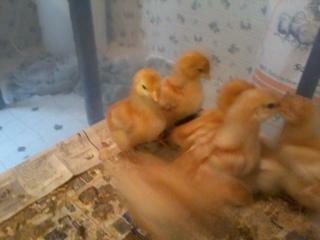 The pullets (still unsure of the Breed) are now 16 days old and still growing. My husband and I are renting a property which houses not one but TWO metal storage buildings. One in which we plan to convert into our chickens new (temporary) home.